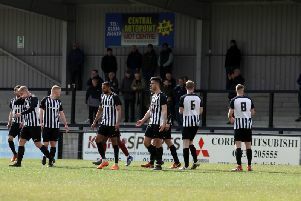 Tommy Wright has revealed the scale of the challenge in front of Corby Town if they are to still have a say in the title race in the Evo-Stik Southern League Premier Division. Poole Town moved five points clear of the second-placed Steelmen thanks to a 6-0 win at Bideford on Tuesday night and still have two games in hand, making them heavy favourites to secure the automatic promotion slot. Corby are preparing for their trip to Paulton Rovers tomorrow as they aim to extend their unbeaten run in all competitions to 11 matches. Wright insists he “isn’t naive enough” to believe that run will continue until the end of the season. But he believes his team can only afford just one more slip up if they are to push Poole all the way. And he is determined to see Corby keep their side of the bargain. “The confidence is there and is thriving through the whole club from the fans to the players,” the Steelmen boss said. “We have to remember what these lads have done so far when some may not have expected it. “We are on a terrific run but I am not naive enough to think it won’t end at some point. And if that happens, we don’t want it to be a massive problem. “We need Poole to slip up, that’s obvious. We can only probably afford one more mistake between now and the end of the season as far as the title is concerned. “That’s the task in front of us, it’s a tough one but we will try our hardest. “We are running out of games and we are going to have to win 12 out of the 16 we have left. It’s a massive task but I still have confidence that we can do it. Central defender Herve Pepe-N’Goma is set to be in the Steelmen squad after the youngster joined on loan from Leicester City this week while Edi Appleton is unavailable as he attends a family wedding.